Belle Meade has long been considered the bellwether for the upper-end housing market as the neighborhood is loaded with old and new money. While touring the older homes, buyers become aware that many longtime residents of the land are happy with their homes that have functioning kitchens and comfortable flow for entertaining. Theses houses have welcomed their friends for years and years, or decades and decades as people like to say these days, literally (another crowd favorite). While Belmont has flashes of high-dollar sales and mansions are lining the West Meade foothills, Belle Meade consistently ranks as the leader in residential real estate investment. Much to the chagrin of the some of the old guard, many of the hallowed residences have been demolished, some selling for more than $5 million. Regardless of the overall size of the home and the financial investment, architects are designing the new home for contemporary lifestyle, in many cases abandoning any semblance of the structure that so proudly welcomed the wizards of Wall Street into the incubator of companies that are now famous for their successes. When the older homes were designed, the idea behind the kitchen layout was functionality, and the homes housed kitchens like many of the great restaurants of the day, relatively small and remarkably efficient. The master bedrooms were on the second floor as seclusion from the goings on downstairs was often necessary, plus the children’s rooms were there. Through the years, the zoning and building codes have, at times, been undecipherable, most written and enforced as reactions to outsiders who slipped into the area and constructed something that was appalling to the neighbors. Since Belle Meade is its own city with its own mayor and commissioners, it can regulate with stricter zoning and codes than Metro Nashville, and does. Most developments and subdivisions – through their restrictive covenants and master deeds – have various sideline, front and rear setback guidelines, as well as a defined footprint for the structure. At times, that footprint alone will define the square footage. But just in case it doesn’t, there are often maximum and minimum square footage regulations. For years, the restriction in Belle Meade was for cubic feet. Therefore, a house with 2,400 square feet on each of the two floors might need to have nine-foot ceilings on one floor and eight-foot ceilings on the other, lest it have too many cubic feet. In short, a 4,800-square-foot house might comply with shorter ceilings, while ceilings six inches higher would knock the home out of compliance. Lyle Patterson, the Building and Zoning director for Belle Meade, has worked to bring order from chaos. The process runs more smoothly and the end results are better as elegant edifices are becoming more and more prevalent. Still, in all cases pertaining to construction in Belle Meade, seeking permission is all the wiser than asking for forgiveness after the fact. The latter has been tried and not worked. Not then and not now, despite the architect’s pedigree. Newcomers should be required to pass a history exam based on Bill Cary’s book “Fortunes, Fiddles and Fried Chicken” in order to better understand the territory that they have invaded and to appreciate the business acumen of their neighbors. 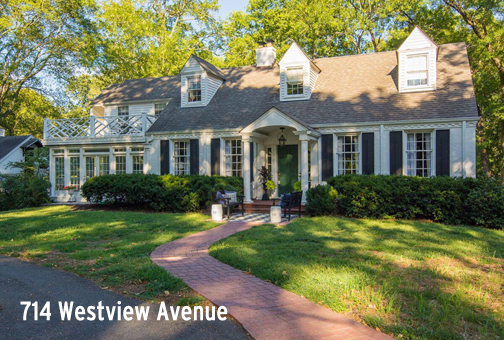 Found on one of Belle Meade’s most coveted street is the home at 714 Westview, an exemplary example of the real estate and architectural trends of the community. Throughout the years, the city has been a haven for entrepreneurs as Hospital Corporation of America and its offspring were born there as one of the three companies that Jack Massey took public along with Kentucky Fried Chicken and Mrs. Winners. The home nestled among mature trees was bought in 1974 for $79,500 and lost in foreclosure to Commerce Union Bank in 1978, with the bank buying the property for a mere $14,800 on the courthouse steps, as that is the most anyone on the steps that day would pay and Commerce Union was carrying approximately $62,500 in debt at the time, which would have to have been paid by a new owner. All total, the sale was for $77,300, slightly less than the owner had paid. Commerce Union later became NationsBank and is now Bank of America. The Belle Meade address does not guarantee success or wealth, and there are as many failures as successes for its denizens. The bank was fortunate to sell the property for $99,500 to one Paul C. Buff, a person who achieved astronomical success in the photographic lighting world with such inventions as the Einstein flash, the Cybersync trigger transmitter and Vagabond Lithium power supply. His real estate investment worked well, too, and he sold his residence in 1988 for $235,000. In 2002, the owner almost tripled his money, selling for $696,000. That seller stayed only three years, selling for an even $900,000. Maldonado is one of the leading brokers with Parks and has developed a niche for selling $1 million condominiums. Carolyn Jennings Jones represented the buyer, who has options galore with the property. Jones is with Reliant Realty ERA Powered. A word of warning: When cruising through Belle Meade, let the driver beware. The city has its own police force sworn to protect and defend its residents and will know that you are not one of them. Speed limits are tricky, and the radar abundant. The judge, while witty and wise, will throw the book at perpetrators. Especially if the men have not seen fit to don a proper cravat. Richard Courtney is a licensed real estate broker with Christianson, Patterson, Courtney and Associates and can be reached at richard@richardcourtney.com.